Museum Musings are an attempt to keep Texadans up to date on what is happening with the museum including current plans, new acquisitions and snippets of island history illustrated with photographs if possible. The musings are published in the Express Lines, Texada’s Calendar Of Events, which is distributed monthly by the Texada Island Community Society. Space is very restricted hence the abbreviated nature of these reports. The author would appreciate receiving comments or information on any matter covered here. Wonder why the area where Paxton Road meets the highway is sometimes called “the Oasis”? It’s a recent nickname coined by Dave and Becky Johnson when they opened their cafe, arcade, gas station and feed store there in the 1970’s. The first settlers in the area came as workers in the Paxton, Prescott and Lakes iron mines (1890). The flat, fertile land also made small-scale farming viable. By 1912 there were enough children to warrant building a log schoolhouse (the Marshall School) on land donated by the Pillats. Provincial School Inspectors’ reports (1920 - 1923) mention 15 new factory-made desks, clean water closets, a swing set in the playground and a newly-dug well. The teacher, a Miss Cullum, paid $30 a month for room and board 1/4 mile away (possibly Burditts’ farm?). Although mine production gradually decreased and fire destroyed the remaining mine buildings in 1922, the Marshall School continued with about 6-8 pupils until 1924. Subsequently the log cabin was home, briefly, to Joe and Bertha Pillat before it was torn down. A small population boom occurred in the area when the Iron Mine reopened in 1952 and gravel roads were built to the sites. Pillats’ trailer court helped alleviate accommodation pressures. The old one-wagon-at-a-time “stump road” to Gillies Bay was improved which allowed workers to settle in the Texada Mines new townsite there as well. In the 1960’s colourful entrepreneur Fred Johnson opened his “Fred's Island B/A” gas station with body shop below and used car dealership across the highway off Paxton road. Fred “made a killing” as highway “mishaps” were more frequent in those days. Vehicles from Northridge Chrysler were barged in regularly. As an active member of the Rod and Gun Club, Fred would also hold regular “turkey shoots” (marksmanship contests) beside his garage. Fred also opened a restaurant in the front part of his house. His entire complex was purchased by the “Oasis” Johnsons in the 1970’s. 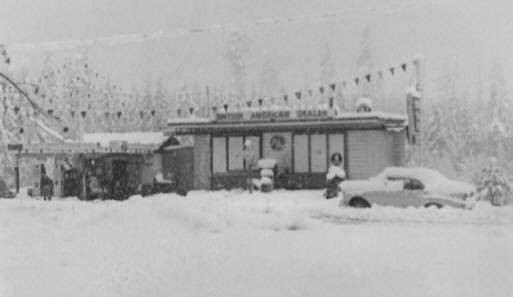 Meanwhile, across the highway, Brian Thompson (senior) built and operated a Marshall Wells hardware store which was later leased to the BC government as a liquor store. Though residential now, the “Oasis” was once an active business area for this small community.